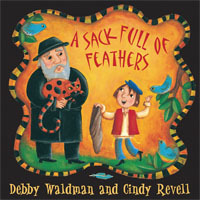 Biography: Debby Waldman's is the author of a number of children's books based on Jewish folktales, including A Sack Full of Feathers, which was named a 2007 Best Book for Kids and Teens by the Canadian Children's Book Centre, and Clever Rachel, declared by Resource Links to be one of the year's best for 2009. She is also the co-author of two books for parents of children who are hard of hearing. She lives in Edmonton, Alberta. More information, visit www.debbywaldman.com. Gossip spreads like feathers in the wind.